I suppose there are a few things I should clarify about the whitework technique embroidery sampler that I’ve been messing around with! First, though – thanks very much for your responses to my question about fabric. Many of you could see the decision coming, methinks: I did change the fabric to the darker linen. The deciding factor was the question of photography. I get better pictures on darker fabric, especially when the stitches need to be seen. You can see that the contrast makes the stitches a lot clearer. In choosing between the two fabrics, I was choosing between this fabric (the darker shade) and a shade lighter than this, but not white. The original fabric I started working on was almost a golden color, but, in close ups and with any kind flash or bright lighting, the fabric tended to wash out, so the stitches were not as noticeable. I also decreased the size of the whole piece. I think it’s 16″ x 18″ now, which is much easier to work on. Now, to explain the whole sampler. I’m afraid the term “whitework” only refers to technique. I realize it is not properly “whitework,” since it is not done on a white ground fabric (which is usually the case with real “whitework”). The point of the samper for me is to explore different types of whitework techniques, demonstrating “how to” and troubleshooting and whatnot as I go. In the process, I’ll work up a few photo tutorials of different techniques for you, like the one on re-weaving the edges in drawn thread work and the one on finishing the edges with satin stitch. The finished piece isn’t meant to “be” anything, other than a sampler. I’m not trying to create a gorgeous work of art or anything, although I do hope it comes out fairly nice! I have no idea what it will look like yet, when finished, but I have blocked out a drawn thread section and a small Ukranian sample, and I’ve transferred a Schwalm design on the fabric, using Christine Bishop’s book, Schwalm Whitework Embroidery (the link will take you to my review of the book). Besides this sampler, which isn’t meant to be my sole occupation for the next however long it takes, I’ve got plans for other embroidery, too – so don’t worry, I won’t bore you to death with whitework (I hope!). In the embroidery arena, I’ve got some interesting things coming up! I’m eagerly waiting some sample projects that I’ll be working on, from some well-known designers. I don’t want to whisper anything too loudly right now, but just so you know, in the near future, there are some exciting projects coming out for embroiderers, with the possibility of some new kits becoming available … and, well. Just a hint: think long and short stitch shading and flowers, and you may just guess who I’m talking about! And, with my present creepy, crawly, cruddy cold dissipating, my voice is getting somewhat back to normal, so there’s a good chance I’ll be able to add sound to some videos this week. (Keep your fingers crossed for me!) I just can’t do the frog voice on something that is more or less public and permanent! Coming up, I’ve got a little photo tutorial on transferring a design using tissue paper (very easy, though somewhat time-consuming). 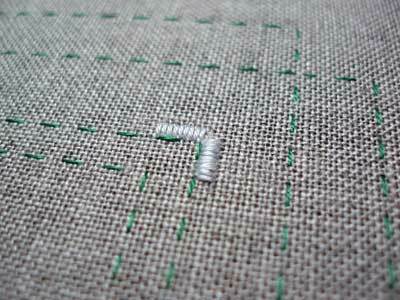 Along with that, look for a photo tutorial on simple hemstitch and a beautiful piece of embroidery from a reader. Also, some thread tips, thanks to Pam and Inspirations, are in this week’s line up. A busy week ahead, but I hope you all enjoyed the weekend, got some stitching done (I managed a wee bit!) and are looking forward to a good week! oh, but a frog voice would be cute!!! Previous Previous post: Free Hand Embroidery Pattern: Valentine!